- Jo Ann Gibson Robinson, The Montgomery Bus Boycott and the Women Who Started It, memoir, 1987, Ch. 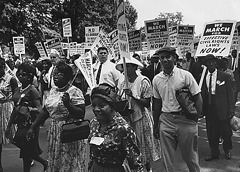 2, "The Boycott Begins"
Images: March on Washington for Jobs and Freedom, 28 August 1963, photographs. Courtesy of the National Archives, Washington, DC (#542044, #542045, #542063).